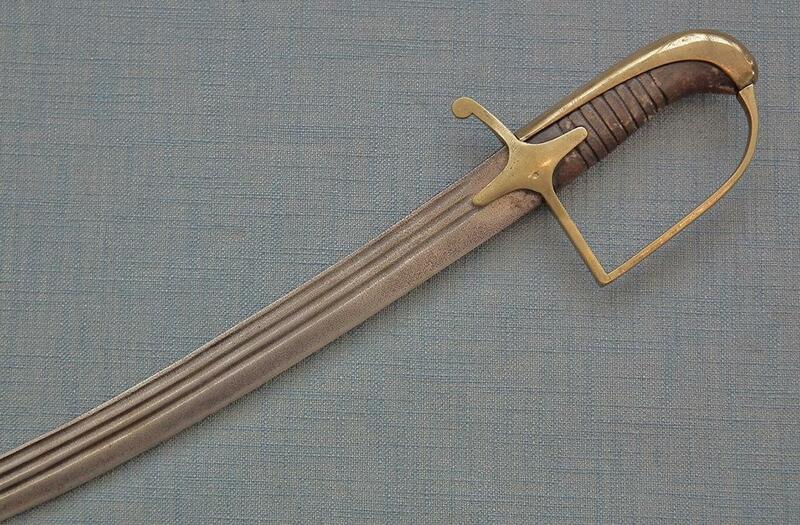 Antique Polish officer saber, sword model wz.1921/22. 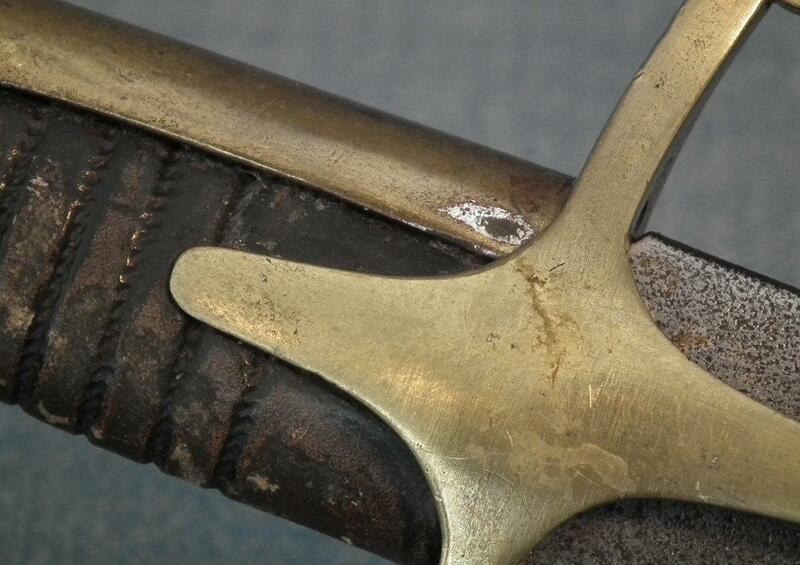 Details: A characteristic regulation brass stirrup hilt comprised of a solid knuckle bow with a pair of langets, downbend rear quillon, and a plain back-strap, retaining its original brown leather covered ribbed wooden grip. The massive curved single edged steel blade is cut with three slender fullers and is double-edged towards the point. There is no other visible marking on the blade and if there was a maker mark it is not any more visible since the blade is pitted. Some combat swords wz.1921 from the collection of the Lubuskie Muzeum Wojskowe w Zielonej Górze z/s w Drzonowie are published in the catalog of the exhibition “Honor i Ojczyzna": szable polskie II Rzeczpospolitej” they also do not have a maker’s name. 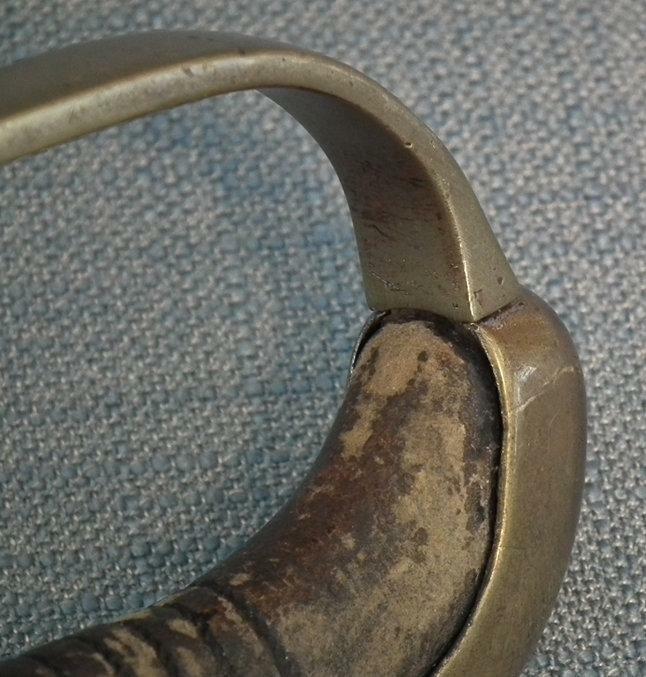 The brass hilt has in several places minor remains of crone nickel plating which was deliberately and thoroughly removed, most likely at the time when the owner of the sword was promoted from non-commissioned officer rank to the rank of officer since the nickel plated brass hilts of the swords model wz.1921/22 according to the military regulation were reserved only for Non-commissioned officers and the brass hilts for officers. 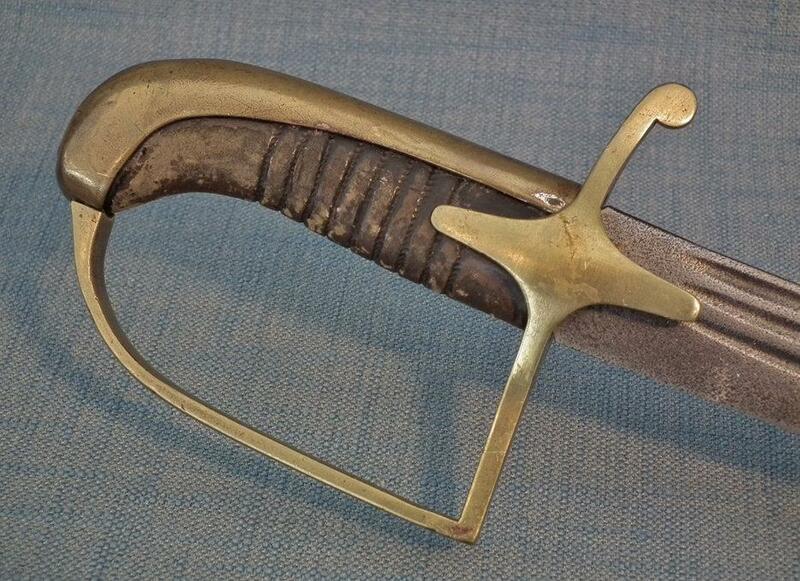 The Polish cavalry non-commissioned officer cavalry combat swords, model wz.1921/22.are extremely rare compared to other versions of the swords of the model wz.1921/22 including the regular Polish officer dress sword model wz.1921/22 with brass hilt. They are a great rarity in museums and private collections. This statement is based on my 45 years of experience from collecting and selling antique arms and armour including antique Polish edged weapons. 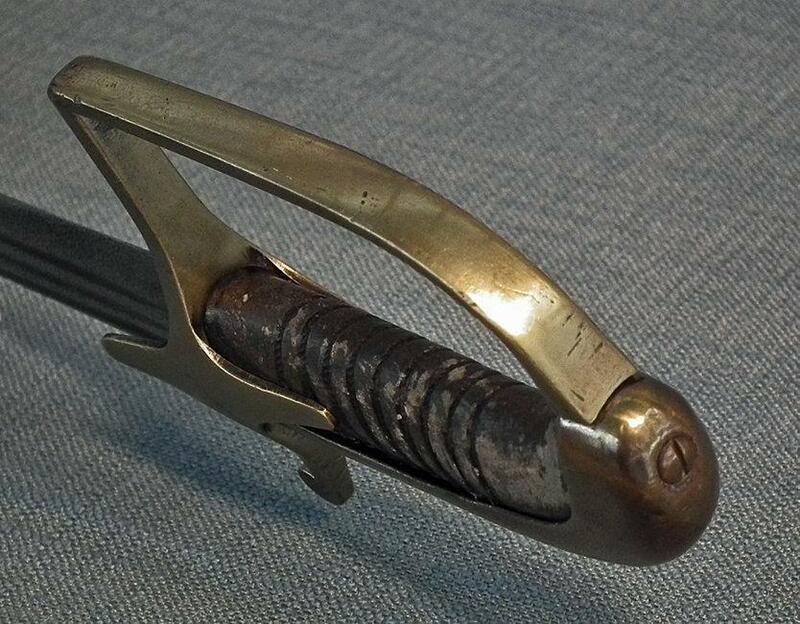 To see other rare objects from this collection including swords please view our store contents. CONDITION: The sword is in its original condition as it was found, with no repairs, or restorations. 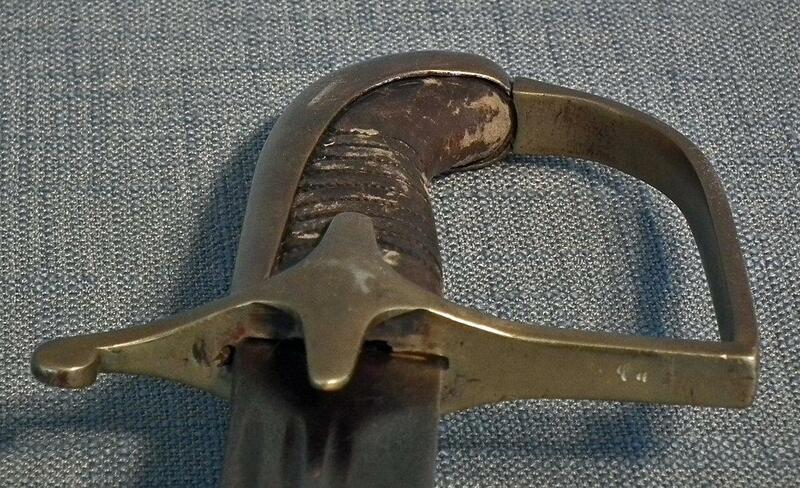 The hilt is in a very good condition leather bind is intact, brass hilt has nicks and scratches. The back-strap has minor dents at the top near the screw, absence of the wire wrapping, blade slightly pitted. All of this is an aspect from a used antique combat sword that is almost 100-years-old. Please see the photos as they are a part of the description. 2. Honor i Ojczyzna": szable polskie II Rzeczpospolitej”Lubuskie Muzeum Wojskowe w Zielonej Górze z/s w Drzonowie Provenance: This sword comes together with other antique Polish arms and armour from an old Canadian collection of Polish antiques and art including antique Polish arms and armour. 3. Od Rokitny do Borujska. Szable kawalerii polskiej 1915-1945 ze zbiorów Adama Lubomira Woźniaka by Włodzimierz Kwaśniewic & Adam Lubomir Wozniak. Buyer will be provided with a copy of the pages from the mentioned references, together with the certificate of authenticity. Provenance: This sword comes together with other antique Polish arms and armour from an old Canadian collection of Polish antiques and art including antique Polish arms and armour. We had attached to the listing a picture of the swords in this collection which we had taken at the time of the purchasing of this collection, showing this sword together with other swords: the first sword from the top. To see other rare objects from this collection including swords please view our store’s contents.